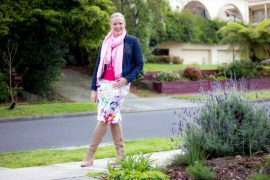 Love your blog, it is my go-to place for understanding fashion and how to look my best! 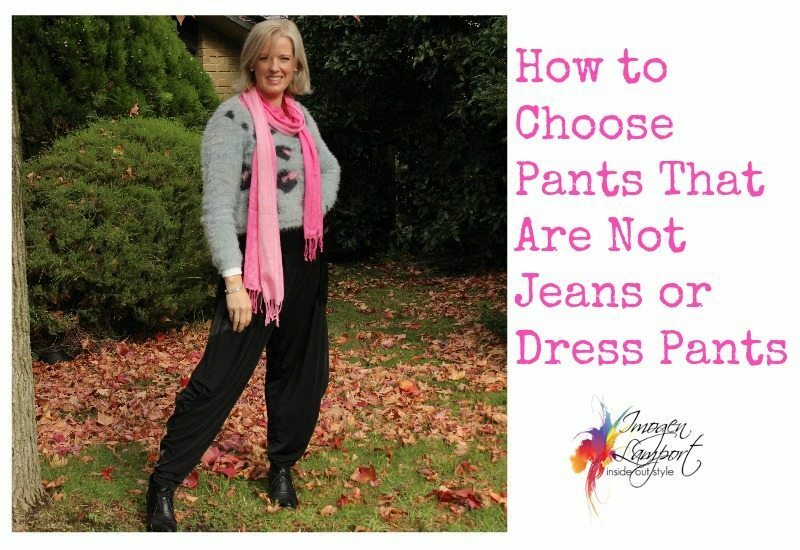 I was wondering if you would consider doing a post on pants (trousers, not underpants). I live in Colorado where everyone is SO casual that I have a very distorted perspective of what is considered appropriate everywhere else. I know and love jeans. I know and wear (to work) dress pants/trousers. Can you de-mystify the styles that go in between? I’m not talking cut, more material, overarching style, and appropriate places to wear them and how to style them accordingly? Hopefully this is making sense – as you can tell I’m super confused about the whole thing! I’m thinking less on the casual side actually. Here everyone wears jeans all the time unless there’s a special occasion or a big meeting and then they put on dress pants or suit pants. But I can only wear jeans on Friday at work and I tend to feel over-dressed in my dress pants so I was wondering about styles of pants that could maybe go from work to out with friends that are professional but maybe less dressy? Jeans are easy, as are dress pants a no-brainer in the office, but how about pants (trousers for you English folk) that aren’t as formal as a suit style pant, but still are dressy enough to feel smart in? Firstly let’s consider the fabric. Anything chunky or rougher is more Level 3 of Refinement so never going to look smart in the way you want – for me that cuts out corduroy and khakis. Instead look for fabrics that are more refined, but not in that classic ‘suit’ or ‘dress pant’ wool, instead maybe in a softer fabric. Maybe something with drape like these harem style pants which can be dressed up or down. Changing the shoes you wear with the pants makes them more or less dressy too! A heel or more refined shoe dresses up a pant, no matter the style, whilst a flat or chunkier shoe makes it look more casual. 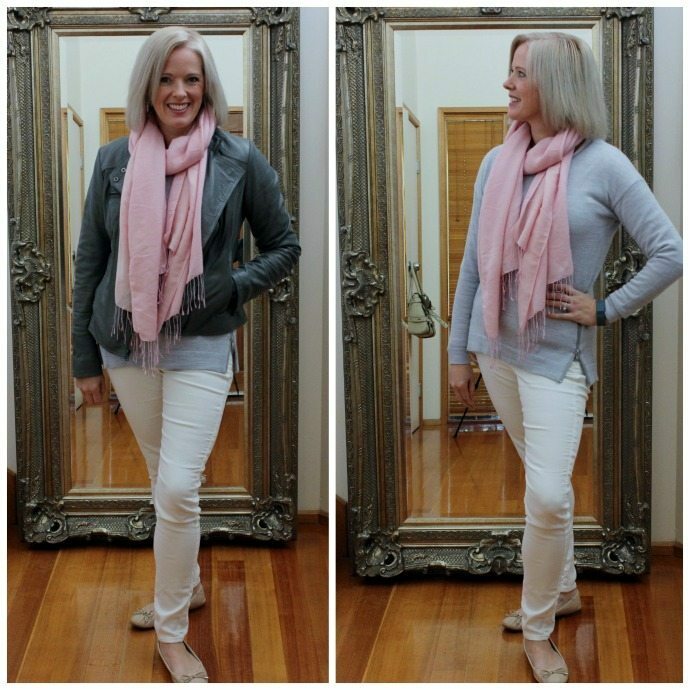 You will see that the outfit above with the jumper/sweater is more relaxed and casual – chunkier fabric, looser fit etc. On the right – same pants, added a heeled bootie, still wearing a knit top (but it’s not too loose) and adding a structured shrug makes the pants look more refined and suitable for both work and dinner afterwards with friends. Secondly think about colour. 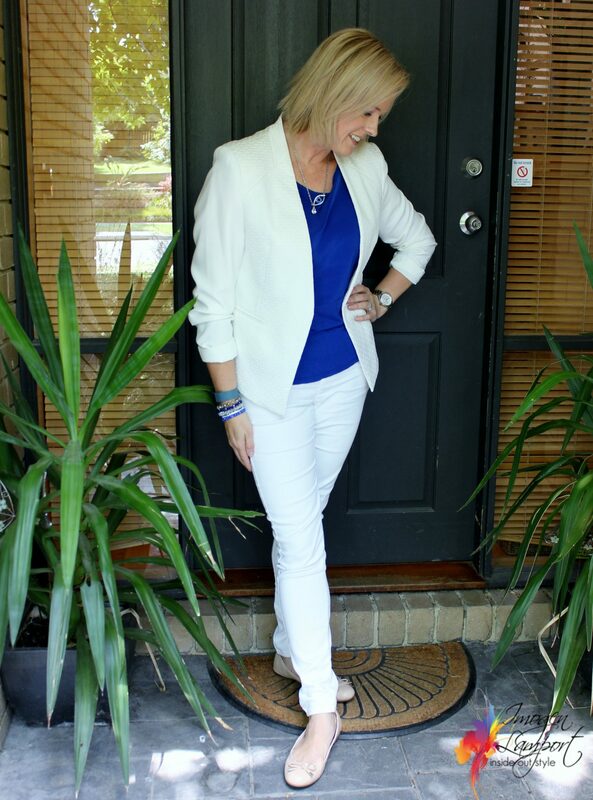 A white jean is a dressier option than a blue jean and can look more elegant, even when dressed down. But it’s simple by changing what you wear with them to make them look really smart. When you think about lighter colours such as white/cream/camel are less professional in a work sense, but because they get dirty more easily, they are not colours you associate with hard labour (unlike blue denim and olive green and khaki which evolved from farms and armies and are all about practicality). So a lighter colour pant is great for going out to a restaurant or bar and socialising as they are not for ‘dirty work’. Consider too what you pair your pants with top wise. A jacket is more structured, so adds a more formal element, whilst a knit top is more casual and relaxed so better for more relaxed meetings. 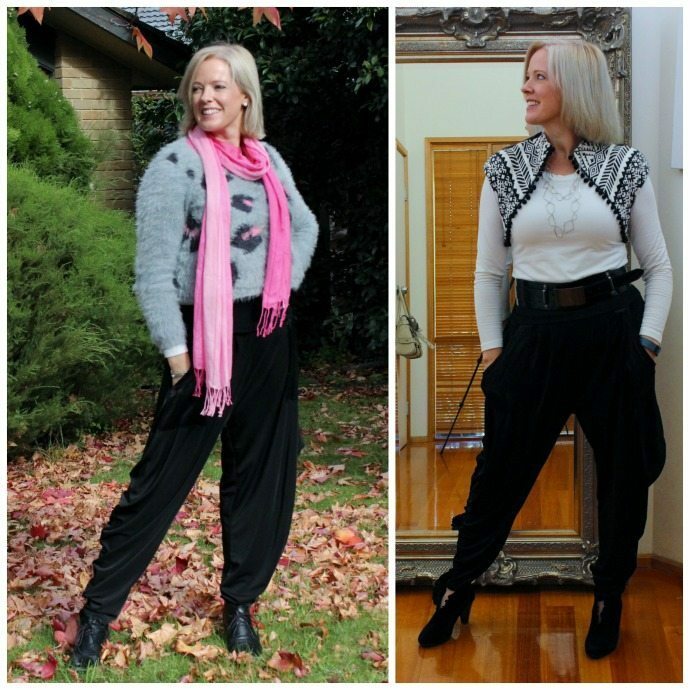 I wrote a post about how to style jogger pants, which in general are a more relaxed style, but I have seen them made from a variety of materials, from track suit fabric (so therefore very relaxed and casual) to suit pant fabrics (so much more dressy and smart). Even adding a soft jacket dresses up a jogger pant! A fabric with a little sheen also makes a pant look dressier and these ones below also have some interesting ruching detail up the sides too. Wearing a slim pant or legging style pant with a tunic top in a more refined fabric can span a more casual to a dressier event, depending on the top and the accessories you choose to go with them. Remember always the shoes make a big difference. 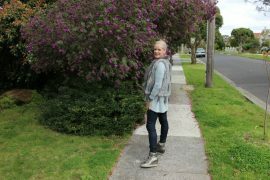 Check out this post I wrote many moons ago about what your shoes are saying and you can imagine how much of a difference even changing your shoes can make to how smart or casual your outfit appears. 1. Shoes – heels and styles make a big difference to the formality or dressiness of the pants – higher heels and finer details are more dressy, lower heels and chunkier details are more relaxed and casual. 2. Fabrics – Finer fabrics and smoother, lower in texture, or adding some sheen make a fabric more dressy, versus chunkier textures make the pant a more relaxed and casual garment. Adding a top with sheen or sparkle will also make the outfit dressier. 3. Colour – Lighter colours are considered more dressy as they are less practical than darker colours (unless it’s black which is considered dressy). 4. Structure – what you team with your pants – adding a jacket or a garment with more structure makes it a smarter or dressier outfit. Even a blazer with a pair of dark blue distress free jeans and a pair of heels makes jeans look smarter. 5. Fit – looser fits tend to be more casual whilst more tailored fit makes a garment or outfit more refined. 6. 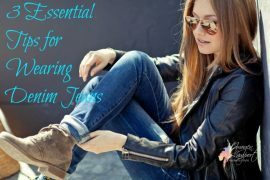 Accessories – how are you layering your accessories with your outfit? Notice how the scarves are more relaxed than the necklaces. Also consider what your accessories are made of – shiny makes them more refined. How can you change your accessories to make them work from day to night? What’s the Personality of Your Jeans? 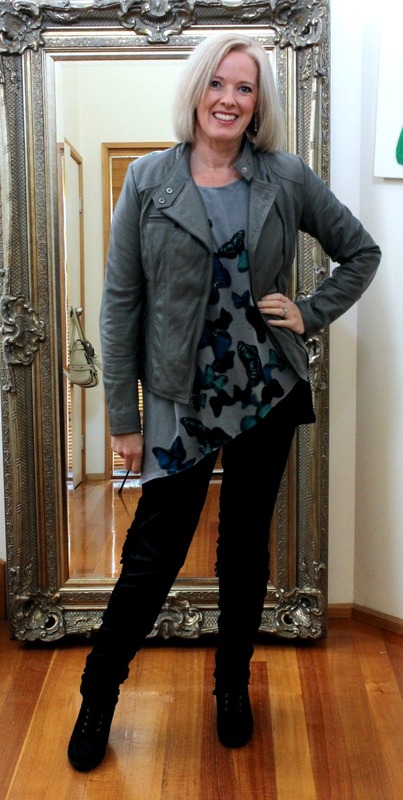 The asymmetrical butterfly tunic is gorgeous. I love the harems and you have styled them perfectly. My favorite shrug is making another appearance and my heart is thumping. The white waterfall cardigan with the light ready for flight scarf is eye catching. Well done on these. I am inspired. i have only recently discovered your website/blog and I am fascinated by the amount of free information you share with us. Where do you find the time to look after your blog and also be a personal stylist? You must have an efficient team of people working with you or you are a super woman! Btw I was wondering if everything you share on this website is also part of the course you propose as personal stylist. Serena – it’s just me – no team! 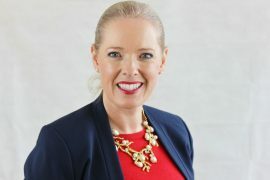 I am just super busy and try to be efficient (and work too hard my husband says)! 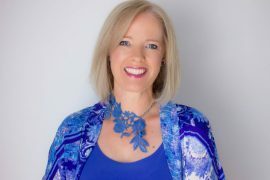 Our personal stylist training includes much of what is here and a whole lot more – the technical details – we also have hours and hours of video talking through each lesson as well. This blog is a great resource for anyone doing the training program too.